If you were to ask me which room is hardest to keep tidy, I’d say the bathroom. It is home to lots of small items that are used too often to be tucked away. Even the most diligent unclutterer’s sink or vanity can become a mess in no time as an endless parade of toothpaste, brushes, deodorant, razors, and floss makes its way into your home. I spent a lot of time searching the internet for the best bathroom organization solutions. I don’t mean cutesy stuff that’s more clever style than substance. Instead, I’ve tracked down several useful ideas that you’ll actually want to put in place. Let’s start with several items that love to congregate on vanities everywhere: toothbrushes and toothpaste. A cutlery sorting tray can keep these items separated and out if sight. 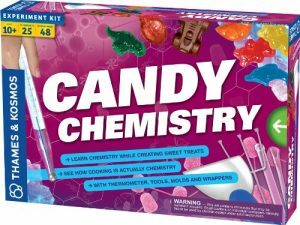 I suggest using a plastic tray that is easily removed, as you’ll want to clean and sanitize it periodically. These things amass themselves incredibly quickly. Spice racks mounted to the wall will hold hair spray, lotion, mouthwash and more that would otherwise clutter up the vanity. It’s tempting to toss these into a drawer (or, if you’re my daughter, anywhere at all). Adhesive magnetic strips attached to the inside of a drawer or cabinet door will corral these small, easily lost items. Now we’ll move from small items to larger ones. Here’s a fantastic idea for storing bulky hair dryers and curling irons. Some PVC cut perfectly and stuck to the inside of a door keeps them out of site yet at hand. 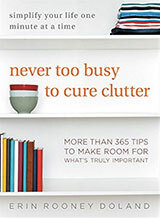 Of course, there’s no “miracle fix” for bathroom clutter other than diligence. Hopefully one of these projects will inspire you to tacking a particular cluttered area. The loss of anyone with whom you have a close bond, including pets. The ending of a close relationship such as estrangement from spouse, sibling, parent, friend or even a business partner. Physical, mental, emotional, and/or behavioural changes of a close family member or friend (such as a parent diagnosed with dementia or family member struggling with addiction). Moving away from a long-time home, even if the change is due to a happy event like a new job or marriage. A military deployment of a family member, even if the deployment is not to a hostile area. The realization that a lifetime goal will never be achieved for example you did not get an anticipated job promotion or not accepted into a certain school. For some people, the loss of certain possessions can trigger grief such as having to part with your first car or losing your wedding ring. Grief causes stress and stress creates physiological changes in the body and brain. This may cause you to feel and act differently compared to non-stress situations. Although everyone feels grief differently, it is common to experience fatigue and irritability much more quickly. It may also be more difficult to concentrate, make decisions and solve problems. Sometimes during periods of grief you may be expected to remain productive or even do some major organizing. Here are a few tips to help you through this difficult time. Get help with the grief. The most important thing is to get help to manage the feelings of grief. Confide in a friend or family member. Schedule an appointment with your doctor or mental health professional. Look for community support groups in your area. Adjust your expectations. Now that you know grief interferes with your ability to organize and make decisions, accept that during this period you probably won’t be at the top of your game. Relax and don’t be so hard on yourself. Prioritize. Our previous posts, Managing the overwhelmed feeling and Seven ways to cope with stress offer some great advice on prioritizing. Reduce the number of decisions. Some people try to reduce uncluttering to one decision – either keep everything or keep nothing. It could be that neither of these options is the best. Yet, deliberating over each individual item is frustrating and time-consuming. Instead, make some overarching decisions. For example, if you’re uncluttering books, you may decide to keep only those that were signed by the author and let the rest go to charity. Reduce the time, increase the frequency. If you’re having trouble concentrating on one task, try changing tasks. You could unclutter or organize during the commercial breaks of your favourite TV show. You could alternately read one chapter of a book then organize for a while. There is power in just 15-30 minutes a day. Hire a professional organizer. 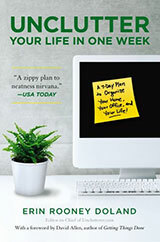 Members of the National Association of Professional Organizers (NAPO) and the Institute for Challenging Disorganization (ICD) are skilled in helping people who are having difficulty with organizing and productivity. They are also caring, compassionate, and discrete. If you have tips for our readers on how to stay organized and productive during periods of grief and bereavement, please share them in the comments. Decision fatigue is always a potential problem when you’re uncluttering. You can get to the point where you’ve made so many decisions that making any more seems like more than you can handle. When you find yourself at that point, it’s time to take a break. A new study from the National Institute of Standards and Technology (NIST) found that a majority of the typical computer users they interviewed experienced security fatigue that often leads users to risky computing behavior at work and in their personal lives. There are two ways to avoid relying on your memory. The first is to use a password management program. I use 1Password, but other people like LastPass, KeePass, or one of the other available choices. A password manager can store your passwords (and your answers to security questions) so you don’t need to remember them all. If you don’t want to use a password manager, writing your passwords down can be okay, too — Schneier has actually recommended that. I’ve had my wallet stolen, so I wouldn’t feel good about keeping my list of passwords there (as he recommends) unless I did something to obscure the password, as suggested by Paul Theodoropoulos in a blog post. But keeping a list of passwords in a file folder with an innocuous name might be fine. Or you could write them inside a random book, as another blogger suggested. The first type of password is easily created using a password manager. LastPass even has a random password generator anyone can use. The second type is created using an approach known as Diceware, which is fairly tedious. But there’s at least one website that provides a Diceware app, making it extremely simple to generate these passwords. A Diceware password like doodle-aroma-equinox-spouse-unbolted might be odd, but it’s easier to remember than something like 831M5L17vY*F. (Of course, you can just cut and paste your passwords in many cases, but sometimes you really do want one you can remember.) However, Diceware won’t work on sites that set character limits that are too short. Do you provide your pet’s name as an answer to a security question? On a banking site, you might want that name to be something like Z8#3!dP47#Hx or grill-anthem-tinderbox-baguette-cosmetics. On a less important site you don’t need to be as cautious, but using your pet’s real name is still a poor idea. While working on last week’s unitasker post I came across another unitasker — Finger Stand Support Rests. 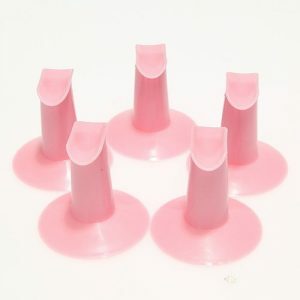 This is a set of five hard plastic stands on which to put your fingers when you’re painting your fingernails. The stands are not attached to each other so you’ll have five little things cluttering up your cosmetics bag/drawer. When painting your nails, the finger stands must be perfectly spaced to support all of your fingers. If your hands are small, you’ll have to stretch because the bases of the supports need to be wide enough to stop the stands from wobbling. I can’t imagine that they are comfortable being made of hard plastic. Wouldn’t it just be easier to use a rolled up towel under your fingers? A towel would be much softer and you could cover it with a napkin or tissue to absorb any nail polish spills. That’s exactly why I continue to use it: free, web-based (which means nearly ubiquitous access to your files), easy and accessible. But just like any tool, your Google Drive can become disorganized. Here, I’ll describe some best practices you can adopt to organize the files you’ve got stored in Google Drive. Let’s begin with something simple: sorting. Once you’ve got a lot of files on your Drive, it can be tricky to find the one you’re looking for. Fortunately, you can quickly sort the list. First, click the button on the top right to toggle between List View and Grid View. Both sort folders from files, and list view lets your further sort by title or creation date. Google is synonymous with “search” (how many times have you heard someone say, “Google it”? ), and as such you’d expect robust search options in its products, like Drive. A simple click reveals that they are in place. All of this makes it very easy to find the file you need. Occasionally you’ll want to move, share or otherwise interact with several files at once. You could click them one at a time, or hold down Shift as you click to select in bulk. This tiny tip can be a huge time-saver. You can add a star to any file or folder in Google Drive by right-clicking on it and then selecting the star from the resulting contextual menu. All starred items are immediately accessible from the star menu in the left toolbar. Just don’t go too crazy with this feature, or you’ll have a list of starred items that just as unwieldy as the “un-starred” masses! You can quickly preview a document without opening it to save a lot of time. Simply click once to select it, and then hit the “eye” icon that appears in the toolbar above to get a peek at what that document contains. Finally, consider the huge library of add-ons that are constantly being released and refined for Google Drive users. These easily-installed tidbits address all aspects of using the service, with the focus on making it more efficient. PC World recently published a nice round-up of great Google Drive add-ons, including Consistency Checker, which scans your docs for incorrect hyphens and other such errors, as well as Data Everywhere, which makes it easy to share across platforms (Google, Excel, etc.). I hope this was helpful. As I said, Google Drive is a fantastic collaboration tool. With a little effort, you can make it an efficient, organized experience as well. Dave recently provided some great tips for buying a filing cabinet. The following are a few additional suggestions from my own experiences. With any organizing project, buying the containers (in this case, the filing cabinets) is one of the last steps. If you don’t remove the paper clutter first, you may wind up buying more storage than you need. So much information we used to keep in files can now be found online. And if you’re comfortable with digital files, many papers that you receive which have valuable information can be scanned, reducing what needs to be kept and filed. But once you’ve decided what to keep, be sure to buy filing cabinets that can store all your papers without overcrowding the drawers. It’s nice to keep each drawer no more than 80 percent full so it’s easy to add and remove files. Many people just need files for letter-sized paper, but you may have documents you want to keep in paper form that are larger (such as real estate documents in the U.S., which are often on legal size paper). Some filing cabinets can accommodate multiple paper sizes. 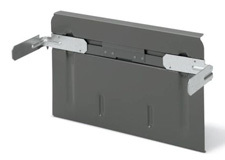 I recommend you totally do away with the hanging-file hardware and use just plain folders standing up by themselves in the file drawer, held up by the movable metal plate in the back. Hanging folders are much less efficient because of the effort it takes to make a new file ad hoc. This advice seems to have been removed from the latest edition of Allen’s book, but it might still appeal to you. If you want to go this route, you’ll want a filing cabinet that has those movable metal plates, often called follower blocks. Some filing cabinets have drawers that don’t pull all the way out, making it hard to reach the files in the back. Be sure to look for cabinets with full-extension drawer slides (rather than something like three-quarter extension) so you can easily reach everything without scraping your knuckles. If you’re at all concerned about the cabinet falling over — because you have small children or you live in earthquake territory, for example — get the materials needed to anchor the cabinet to the wall. Just because so many people use filing cabinets doesn’t mean you need to do the same. 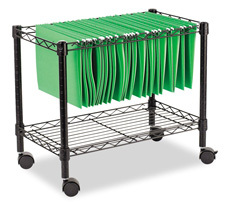 There are other options, such as file carts, which may suit your organizing style better. Or you may prefer to keep at least some papers in binders rather than in file folders. I’ve spent most of my career working in places where painted fingernails were not permitted, consequently I’ve never spent a lot of time thinking about how to best to apply nail polish. I innocently assumed that you would place a bottle of nail polish on a flat, stable surface (perhaps in a bathroom at home), and proceed to paint your fingernails. But why look for a flat, stable surface when you have Tweexy, the wearable polish holder. This light-weight, portable gizmo will allow you to easily open your nail polish bottle using one hand and polish your nails in a car, on a train, at the movies, on your bed, or even in the bath! Maybe I’m missing something because I don’t paint my nails that often, but I just can’t imagine my own hand being more steady than a flat, stable surface. Thanks to reader Debbie for bringing this unitasker to our attention. I’m packing for a weekend getaway as I type this, which has inspired me to write an “Every Day Carry” (EDC) tech guide for weekend getaways. You don’t need to carry a lot in order to be prepared for a weekend away. In fact, pocket clutter is real and should be avoided. My “getaway” EDC varies a little from what’s typically on me, but not by much. Let’s take a look. I use my phone frequently when I’m away, particularly to find directions and taking pictures. That puts a hit on the battery, especially when a map app is receiving GPS data. For that matter, I always have a Mophie Juice Pack charged and ready to go. The Juice Pack is an iPhone case with a built-in battery. When my phone’s battery hits 20%, I flick on the Juice Pack and it’s back at 100% in no time. This goes with out saying, but the pocket computer called “iPhone” is completely essential. From finding directions and taking photos to calling hotels, restaurants and family, it’s my go-to gadget. Start on Apple Maps on your iPhone. 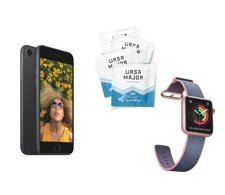 The app will automatically sync with Apple Watch. After you’ve entered the information on the iPhone app, open the watch app to view the directions. I used a face wipe from Ursa Major for the first time a few years ago. I was in NYC visiting family. After a sweaty day of walking through Manhattan, I was given one of these to use. The wipe is cool, smells great and not greasy at all. It evaporates quickly and let’s me “wash my face,” if you will, when I can’t do so properly. It seems like a small thing but I really like these things. That’s the gear I carry when I’m away. It’s a short list, but all very useful. Do you have a special EDC for certain situations? Let me know. Do you maintain a clutter preserve? Earlier this week I was reading a nice series of posts at Organized Home on “Decluttering 101.” It’s always good to brush up on the basics. The author, Cynthia Ewer, shared some good advice, as well as a concept I found quite interesting: the “clutter preserve.” I’ll let her explain it. A part of me shivers when I read this. 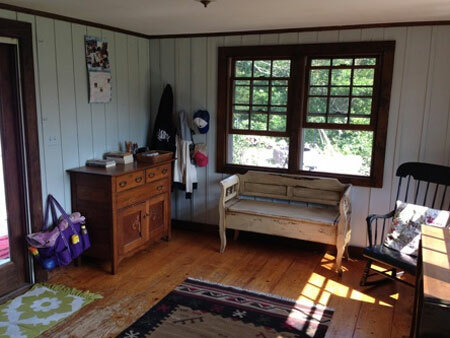 If I create a clutter preserve — even one that’s out of the way — I fear it will foster others. As if it is tacit permission to make a tiny, obscure stack here, an unobtrusive pile there, and so on. I see the logic in it, too. As Cynthia says, no one is squeaky-clean all the time. “Even the tidiest among us tosses clothes on the floor from time to time.” I can even relate this to email processing. Sure, it would be amazing to read and respond to every message every day, but for many of us that is not possible. Now I want to ask you: do you maintain a clutter preserve, or maybe more than one? If so, do you attack it on a regular basis or is it there to offer sanity-saving permission to not be 100% perfect? Sound off in the comments, I’m eager to read what you think. Organizing isn’t something you do just for the sake of being organized. Rather, it’s something you do to make the rest of your life easier. When you’re organized you can find things when you need them. You have the space to do the things that matter to you: have company over, enjoy your hobbies, cook good meals, etc. When you look at getting organized, there are always trade-offs to make. How much time do you want to spend organizing your books, your photos, etc.? One thing to consider is whether the time invested in doing the organizing will save you more time over the long run. I just read an article by Brian X. Chen in The New York Times that touched upon these trade-offs. Chen consulted with Brian Christian, a computer scientist and philosopher, about organizing his digital photos. “If it would take you eight hours to tag all your friends, you should not undertake that until you’ve already wasted eight hours digging up photos of your friends,” said Mr. Christian, co-author of Algorithms to Live By, a book about using algorithmic principles to improve your life. There are photo-management services such as Google Photos that can do some auto-sorting, and Chen went on to write about those. But the basic trade-off concept applies to all sorts of things beyond just photos. For example, I organize my books into general categories but don’t bother alphabetizing the fiction by author because I can find books quickly enough without taking that next step. Similarly, as we’ve noted before, many people will find that they don’t need a bunch of folders for email because they can rely on their computer’s search function to find what they need. But others find that using folders works better for them, even if that makes email filing more time-consuming. People think it might look neat to have all matching plastic containers in their pantries that all nest nicely together and present a picture-perfect shelf. But for the ROI of simply having a pretty pantry, you have to spend a lot of time transferring every new food item from its original store packaging into the containers. But if it really makes you happy to have a pantry with beautiful matching containers, then maybe you’d want to transfer foods into them even though this doesn’t make sense from a purely practical perspective. That’s a perfectly fine choice to make if it works for you. Color-coding provides one more example what works for one person might be overkill for another. Does it help you to color-code your files? If so, it may well be worth the effort, money, and space to keep file folders in different colors on hand. However, if you’d work just as well with files that are all the same color, why not use the simpler approach? As you set up your own organizing systems, think about what might be “just enough organizing” to allow you to function well and enjoy your home or office space.